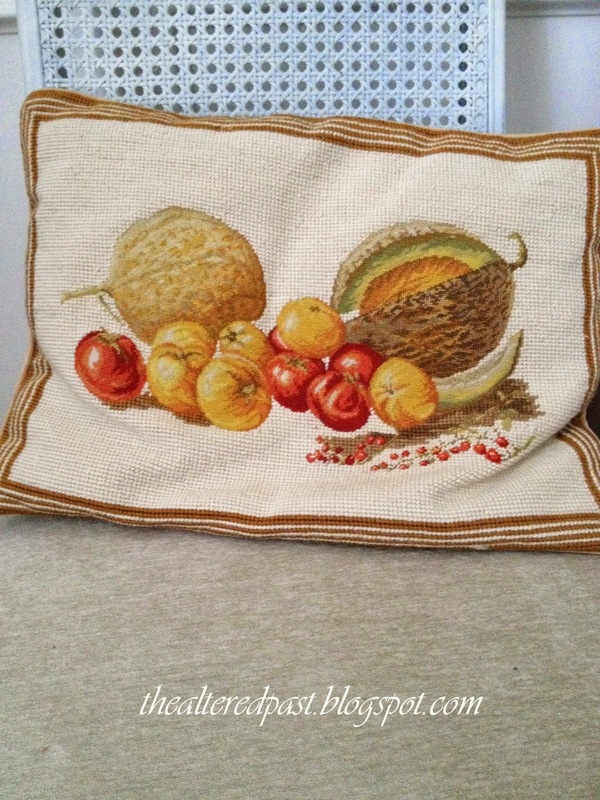 Have you ever made a needlepoint pillow? Maybe not? Me either. I'm too impatient. I can appreciate the time and work that goes into making one. I can only imagine the number of hours spent threading the yarn through each hole of the fabric. So, with so much work and effort that goes into creating these, WHY would anyone simply give these away? Oh, I know, they are making a donation to a cause such as Goodwill or Salvation Army. 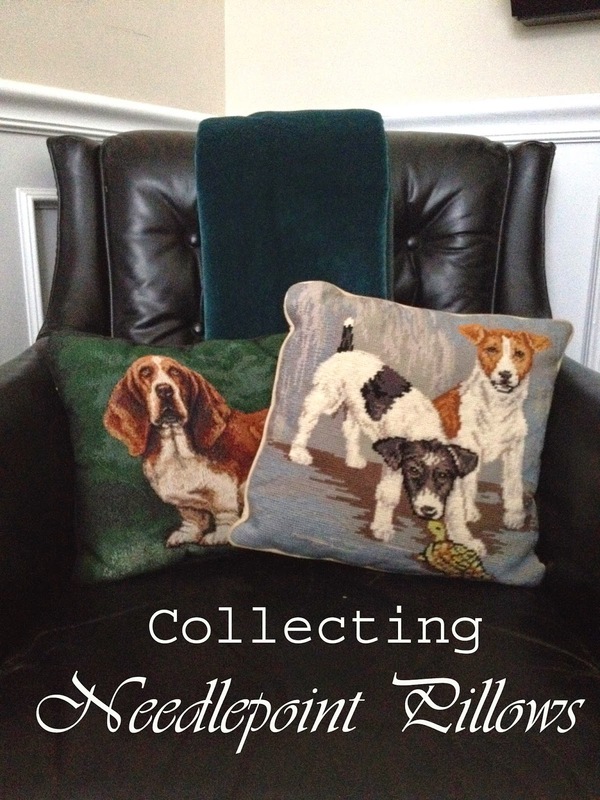 And, I'm sure glad they do because I love collecting these beautiful handcrafted pillows. These are just a few in my collection that I have sitting around my office. 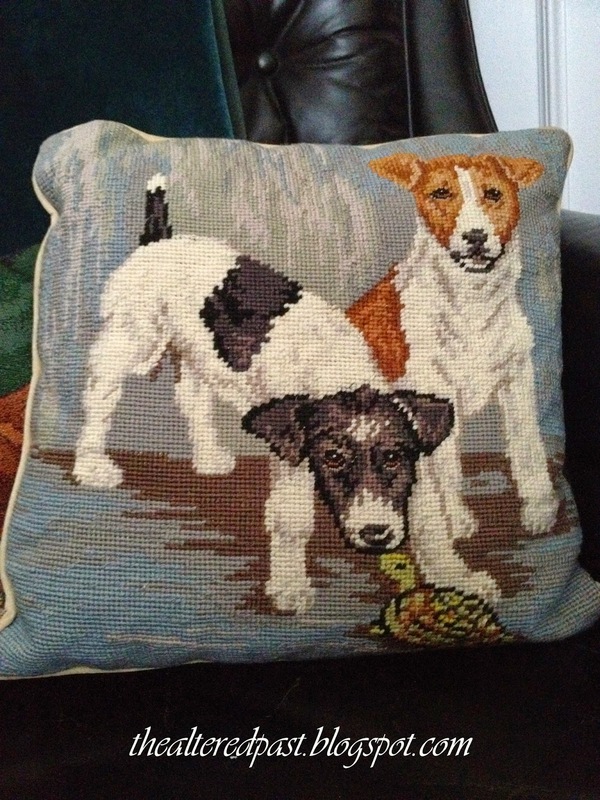 The bassett hound pillow isn't needlepoint but a tapestry done by machine. I loved it anyway. I would hate to admit to the person that spent so much time making these pillows but I picked these up for less than $5 each. 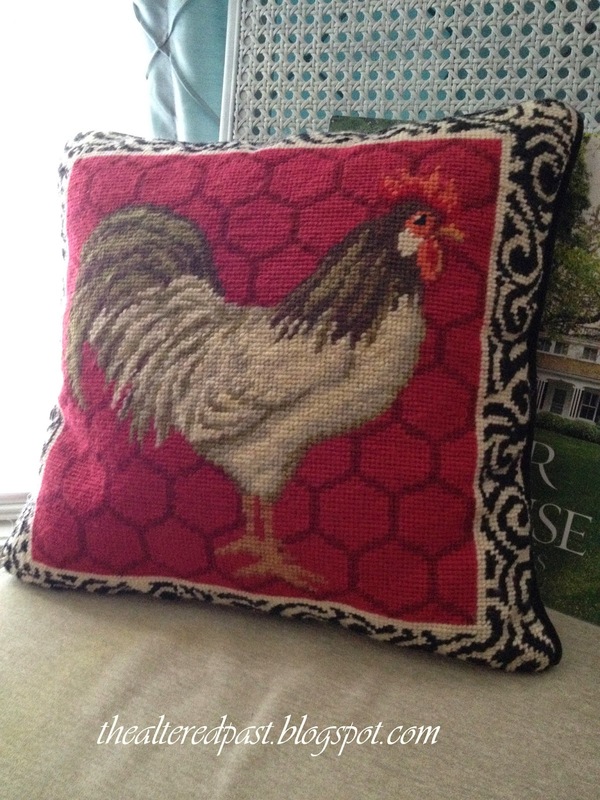 Have you ever seen the price of a completed needlepoint pillow new? Over even on Ebay and Etsy. Five dollars is a steal. 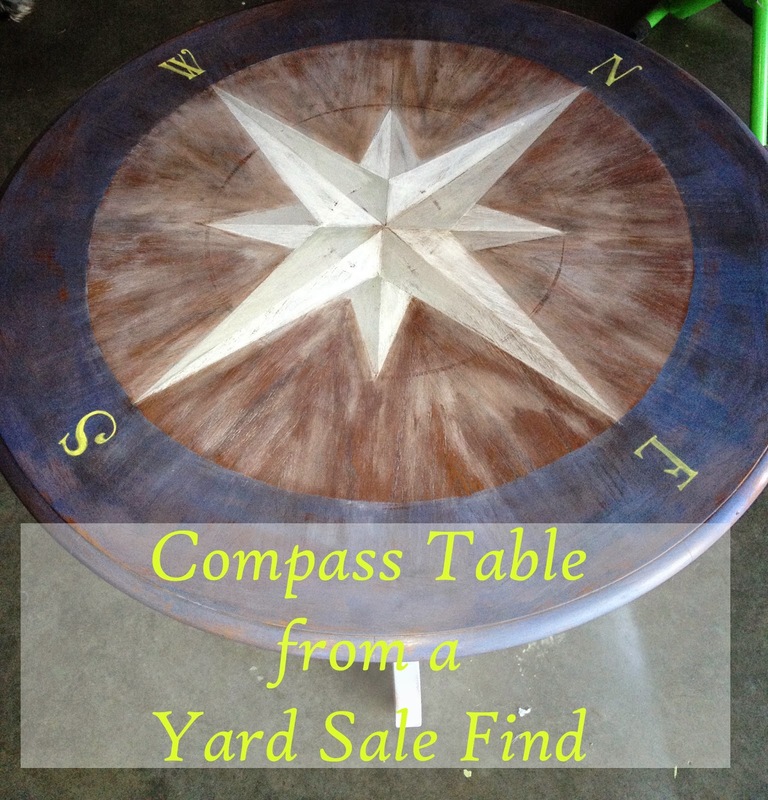 I have been wanting to make a compass table for a while. 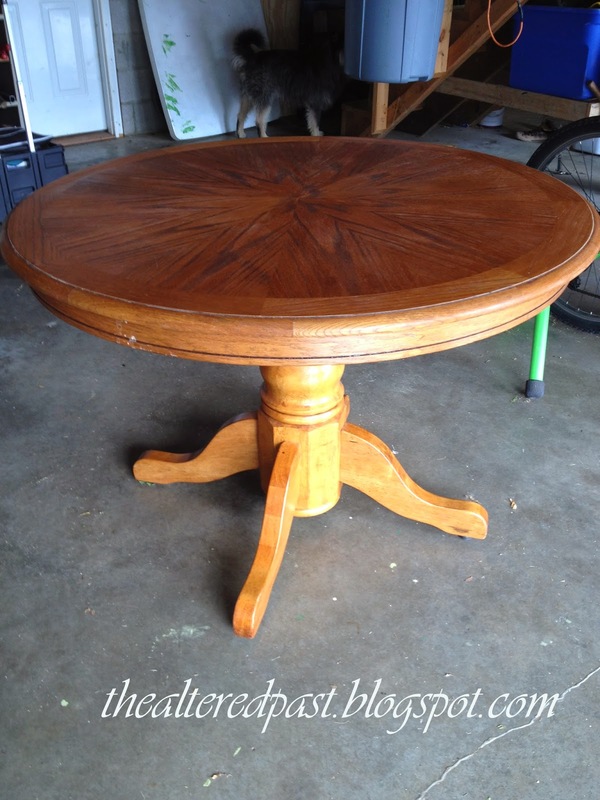 So, when I came across an oak table at a yard sale for $30, I snatched it up. Pretty decent shape...the table, not my garage! I did very little to the table besides a good wipe down with a damp cloth. 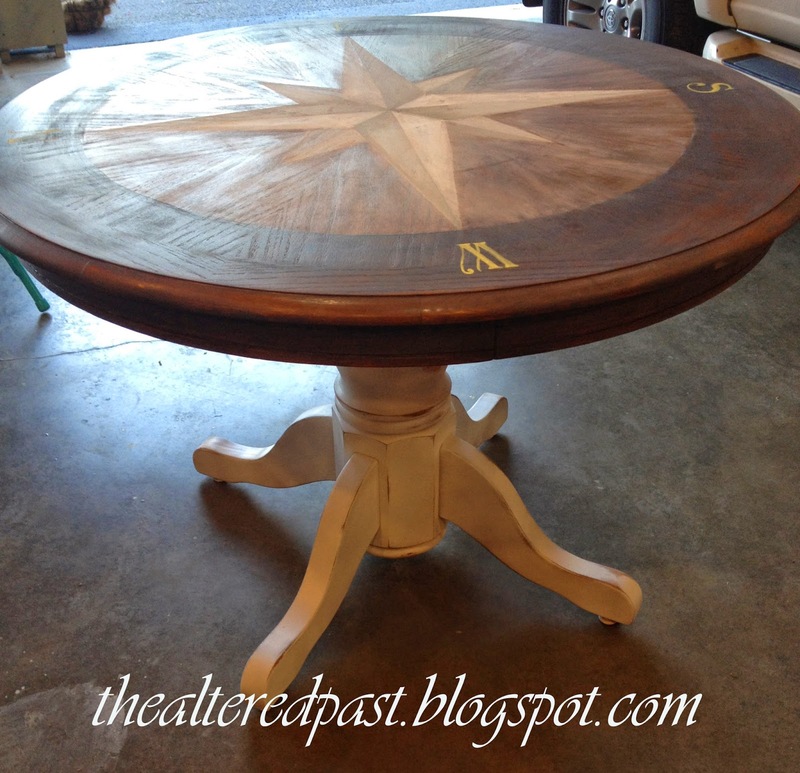 I pinned several compass tables (see them here) to get an idea of the design I wanted. This is going in my oldest daughter's apartment so I knew the color scheme needed to be gray, white, blue, and yellow. Because of the table's construction, it was pretty much divided into segments for me. Drawing out the compass is fairly simple if you think about it like cutting a pizza or a cake. Divide in half, quarters, and then eighths. 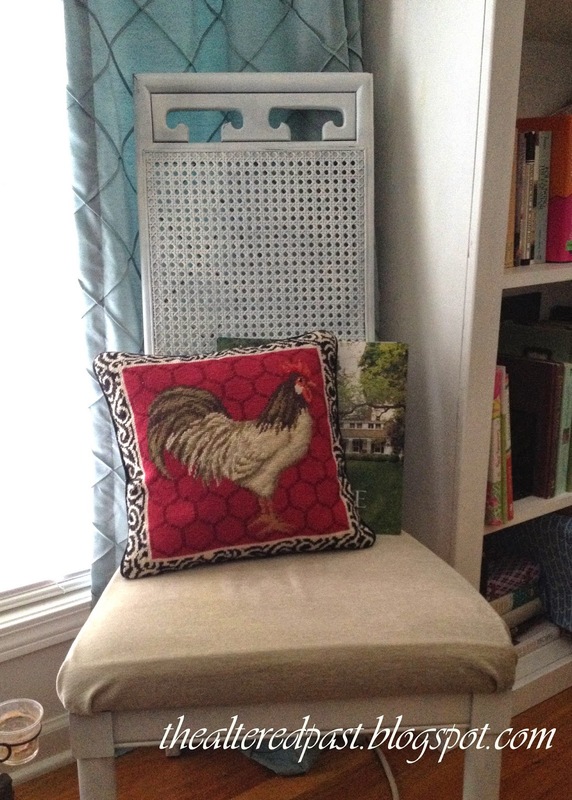 When it comes to DIY projects, I'm somewhat impatient and usually break all of the rules. I'm an instant gratification kinda gal. Like to git 'er done, now! 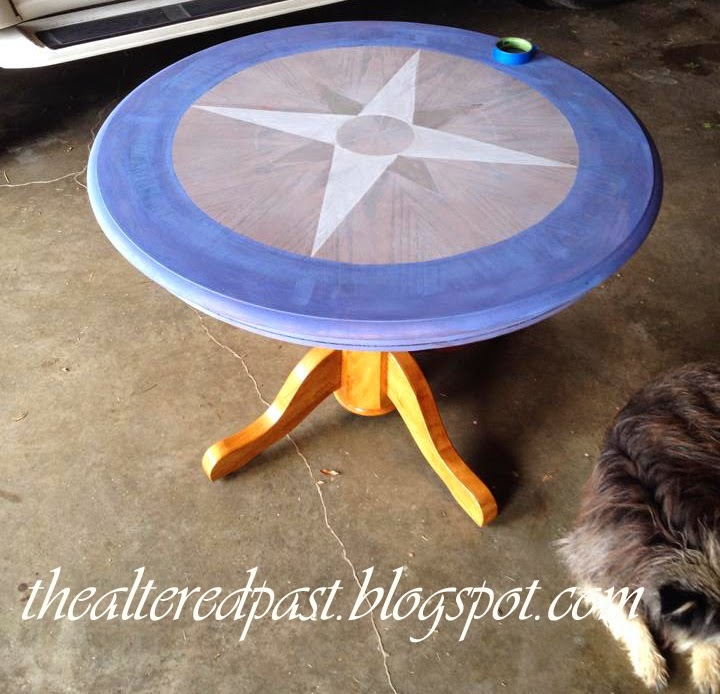 I had an old bottle of milk paint in cornflower blue. I used that for the outer circle. 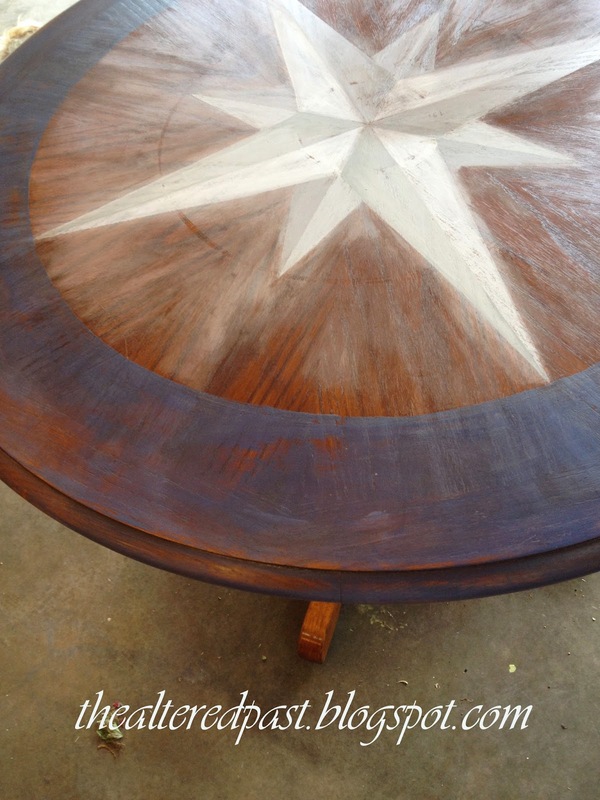 The inner circle was lightly spray painted with Krylon Bright White. I say lightly because the can was almost empty and I needed to make sure I got the entire tabletop covered...somewhat. 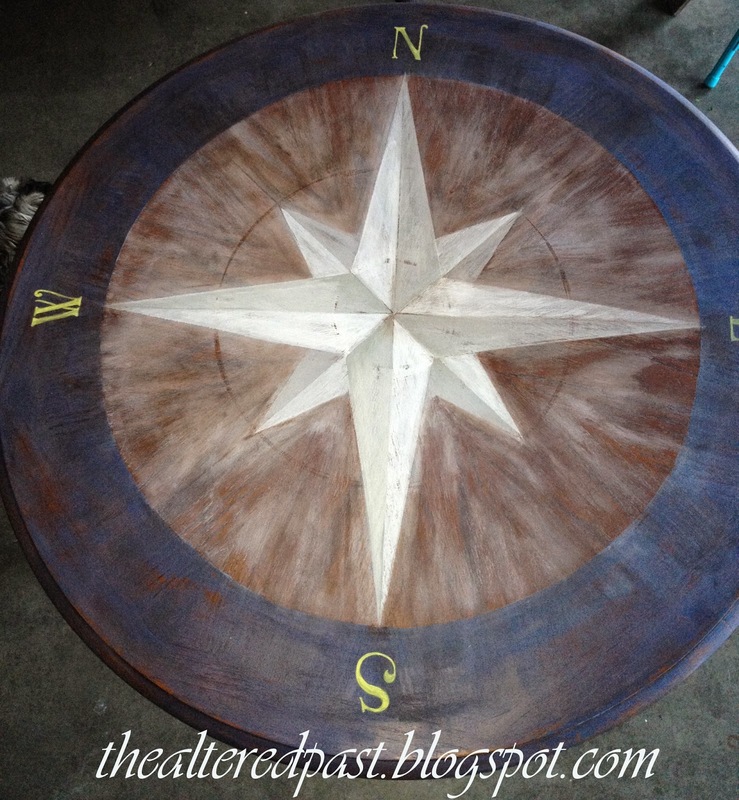 Then, the compass star was painted using plain ol' craft paint in white (uh, almost empty bottle) and gray. I think my rule breaking stems from living 30 minutes from the nearest Wally World or craft store. When I get the hankering to do something, I don't want to take an hour+ running into town gathering the proper supplies. This step is after I sanded the top and began applying a coat of stain with polyurethane. 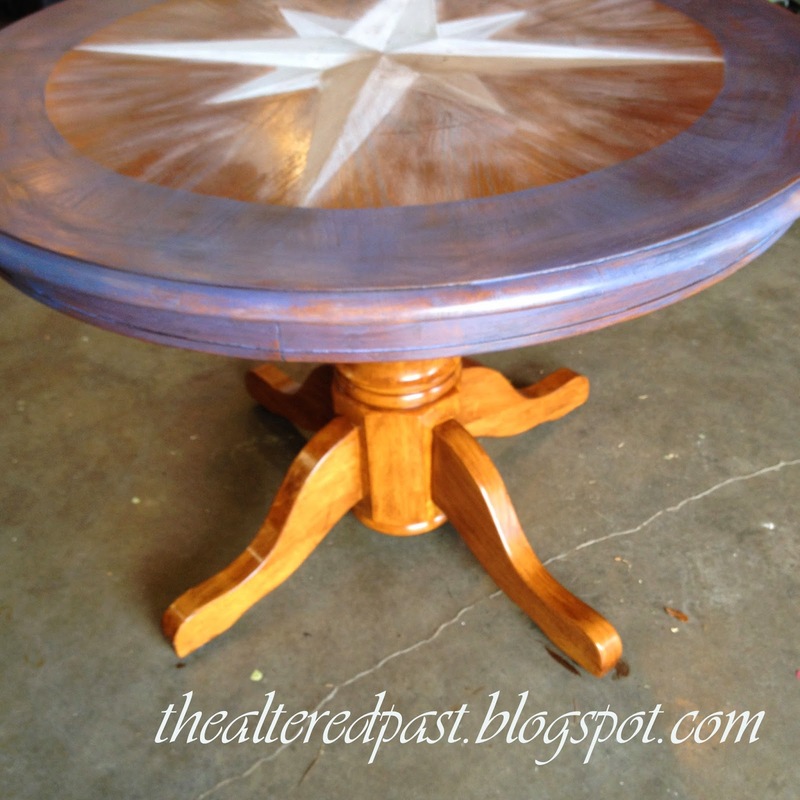 I had a can of Minwax Special Walnut on hand so I used that. I loved what it did to the blue but it muddied the white. And, I kid you not, the can of Minwax was...wait for it...almost empty. So, this is where I left it at the end of day one. Guess where I headed first thing the next morning? Yep, Wally World. So, whadda ya think? I think it was worth that trip in to town. I finished by spray painting the pedestal and legs with Rustoleum's Ultra Cover 2x...love the coverage you get with that stuff. I did go back over the muddied white on the top and then gave the whole thing a good distressing with sandpaper. My daughter is excited about it too. 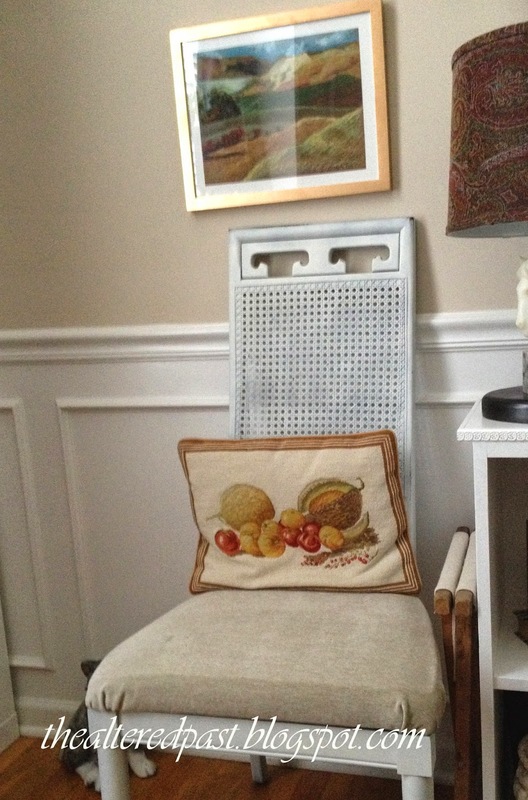 Now to find 4 chairs to go with it before the move-in date in July.